Video clip synopsis – Humans have always argued over territory; it’s just that the weapons get deadlier and the rules keep changing. 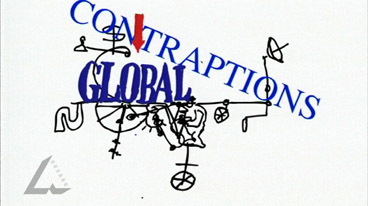 The Global Machine is an episode of the series Human Contraptions (10 × 5 mins) produced in 2002. By studying this five minute Film Australia animation, students have the opportunity to examine aspects of the National Statement of Learning for Civics and Citizenship. Consider the role of government in developing policy and formulating legislation. The main problem with marking out territory is someone else doing it in the same place. In this episode, Bruce Petty looks at the global contraption and continuing efforts to divide the planet, even as a worldwide info net shrinks the globe. Petty’s machine comes fitted with a ‘race-ometer’ for sorting humans according to the shape of their nostrils and numerous refugee holding tanks which are filling up while the fuel tanks are running out. Using a range of data from your classroom – for example, technology equipment, student clothing – develop an argument about how we are, today, part of a globalised world. Is globalisation a good thing? In groups, investigate a range of global organisations that Australia is currently a member of, for example, the United Nations. Explore Australia’s role and obligations in being a member of these organisations. Select two of these organisations and determine how effective they are in achieving their stated goals. Are there any global organisations/treaties to which Australia is not a signatory? Do you think we should be? Give reasons for your opinion.